The shadowy silhouettes of a group of Kinect players gave the wrong impression to their neighbors. 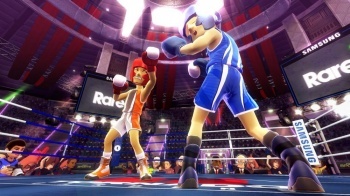 The boxing game found in Rare's Kinect Sports recently caused a major mix-up in Sweden. Swedish police thought they were raiding a house where a murder was being committed, but it was really just a group of people playing the Kinect game. Metro reports that Robert Johansson and five friends were playing Kinect Sports: Boxing when around half-a-dozen police officers stormed into their apartment. The officers had gotten reports from worried citizens passing by the apartment, saying they had seen the inhabitants' shadows making punching motions through the curtains. When police entered, they didn't find anyone being murdered. "It was pretty embarrassing when they came in and asked who we were attacking," Johansson said. "It was just a computer game." A police spokesman said: "We always react to calls regarding domestic violence. Luckily this time it was a false alarm." A similar situation occurred in 2007 when police raided the home of a man that contained a gun-wielding Lara Croft mannequin. Please note: It'd be best to keep your gaming, and gaming related constructs, away from the windows.